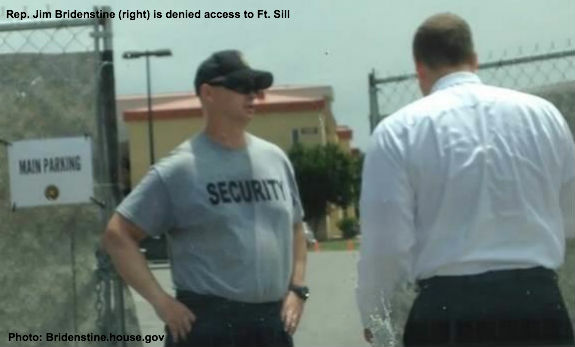 Congressman Jim Bridenstine (OK-1) reports that he was denied access to the HHS facility at Ft. Sill, Oklahoma currently housing up to 1,200 unaccompanied alien children (UAC) who illegally crossed the southern border into the United States. Congressman Bridenstine said, “There is no excuse for denying a Federal Representative from Oklahoma access to a federal facility in Oklahoma where unaccompanied children are being held. Any Member of Congress should have the legal authority to visit a federal youth detention facility without waiting three weeks." The Health and Human Services (HHS) official who appears to be in charge of the facility told Congressman Bridenstine he could schedule an appointment for July 21. HHS Deputy Director of the Office of Public Affairs, Ken Wolfe, would not take the Congressman's phone call. The Congressman was told to send Mr. Wolfe an email as that was the preferred method of communication. Congressman Bridenstine's email to Mr. Wolfe included this press release. “What are they trying to hide? Do they not want the children to speak with Members of Congress? As a Navy pilot, I have been involved in operations countering illicit human trafficking. I would like to know to whom these children are being released."